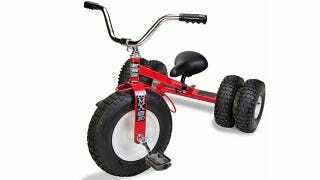 I'm not encouraging anyone to act like a bully on their local playground, but if you're not quite at the age where you can handle a two-wheeled bike yet, this monster truck tricycle will certainly win you some respect. Hand-welded from fourteen and sixteen-gauge steel tubing, the tricycle tackles any terrain with a large sixteen-inch wheel up front, and a set of dual ten and a half-inch wheels in the back. The tubeless tires won't pop or deflate if driven over broken glass or other sharp obstacles, making this tricycle seemingly perfect for use on gravel, dirt, grass, and even soon-to-be crushed cars.